On this webpage I have put some cost and efficiency estimates of different battery types together in a database. The database includes estimates of the capital cost per kW and per cycle (kWh) as well as estimates of operation and maintenance and efficiency. In addition, I have included battery life, replacement cost and decommissioning cost. Some of these parameters like degradation, lifetime, intermediate capital expenditures and cost of capital are drivers of the carrying charge rates. Other parameters such as the up-front cost, the O&M cost and the efficiency are directly included in cost/benefit analysis. To evaluate batteries I have used as a basis, data from studies that have been periodically published by Lazard. These studies have a lot of fancy, but pretty meaningless graphs. The useful data in the Lazard studies on costs, lifetime, duration, efficiency etc. is not available in excel. So, the databases available for download below just put all of the data from two versions of the studies into excel files. 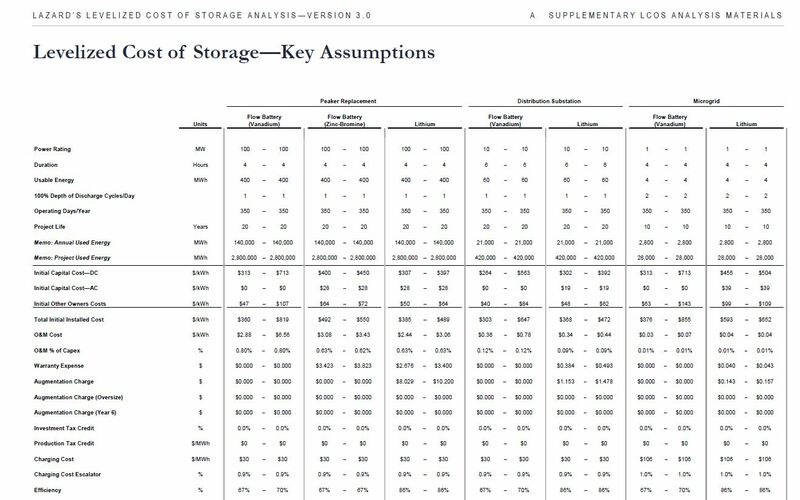 I therefore begin by making a database from the Lazard study which contains costs and some storage characteristics and O&M data for different types of batteries. I have made databases from the Lazard version 1 study published in 2016 and the Lazard version 2 study from 2017. Note that there was more detail in the version 1 study and a very confusing item named auxiliary cost suddenly appeared in version 2 of the study (along with longer assumed life). You can download these two databases by clicking on the buttons below. The screenshot below shows the format of the battery database. The database is set-up so that you can import the data into PowerBI. The screenshot below the database excerpt is an illustration of the type of things you can do with analysis of PowerBI. To create the battery database I have used the read pdf a lot from the Lazard pdf file that can be downloaded. It is a little tricky because of the dashes in the Lazard study. In using the Lazard studies, there are dashes between the low and high cost estimates. These dashes are converted to zeros and must be included in the count of numbers that is used to translate the data. I count 21 pieces of data including the blanks as illustrated on the screenshot below. When you run the read PDF file, you should enter the number of columns (and you may have to run the program twice). Then you can adjust the titles and complete the database. 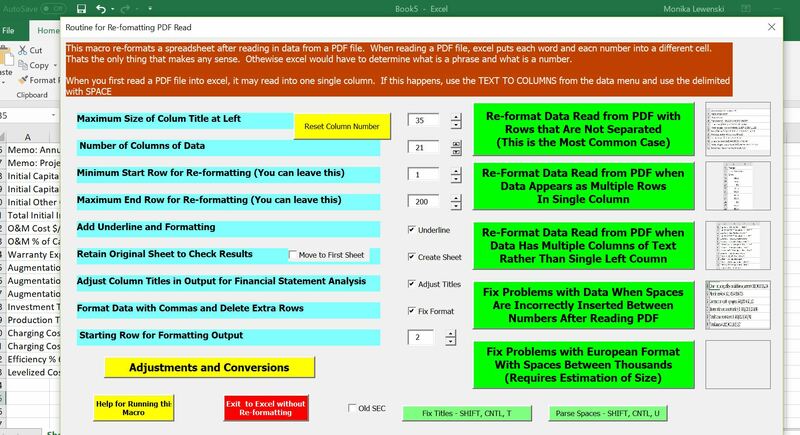 A screenshot of the read pdf used to clean up the data is shown below. Note that there the number 21 is entered for the number of columns. The final database is demonstrated in the screenshot below. I have added a line for the cost per kW of capacity. I also point out the Augmentation Charge that is added to Lithium Batteries that I understand do not really have a 20 year life. In modelling the Lithium Batteries it may be better to use a shorter life and ignore the mythical augmentation charge. I have made a video on how you can efficiently read the Lazard version 1.0 study from the internet. The battery database derived from the Lazard study is included in the excel file below. I think it is useful to export the excel database into PowerBI so you can more clearly see the different characteristics of various batteries. The video below illustrates how you can use the battery database for selecting the best type of battery for analysis from an economic standpoint.